Adani Australia is to locate the regional headquarters for its Carmichael coal project in Townsville, north Queensland, Jeyajumar Janakaraj, CEO of Adani Australia, said in joint media conference with Queensland Premier Annastacia Palaszczuk and Senator Matt Canavan, Australia’s Minister for Resources and Northern Australia. Townsville would also be the location for the company’s project management office and remote operating centre for the mine, as well as providing port services, Janakaraj said. Meanwhile, the Mackay-Bowen region would also provide the site for the rail maintenance and provisioning yard for the almost 400 km of rail line to be constructed between the mine site and the port at Abbot Point. Regional towns, such as Emerald, Clermont, Moranbah and Clermont, would host project service centres. The decision to locate the project offices for the Carmichael project in regional towns marks a change from Adani’s original plan, which located all of its project basis in Queensland’s capital, Brisbane. “Adani is committed to remaining engaged in the development of the indigenous and regional communities, as demonstrated in today’s announcement,” said Janakaraj. The company also said that the announcement marked the beginning of the pre-construction stage of the project, during which Janakaraj promised the creation of 500 – 600 jobs. 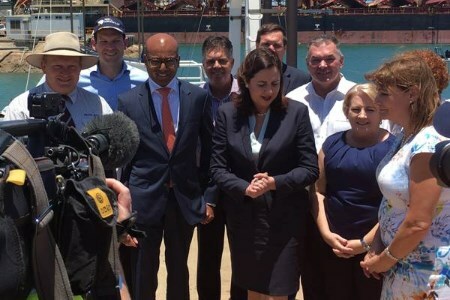 The Queensland government welcomed Adani’s announcement and commitment to locate its project offices in regional Queensland. “The effects of this project will ripple through our regional economies, whether it’s the mining engineering businesses, the construction materials suppliers, the aircraft maintenance crews or the caterers feeding the work crews,” said Minister for State Development and Minister for Natural Resources and Mines Dr Anthony Lynham. The announcement was also welcomed by the Queensland Resources Council, whose Chief Executive, Ian Macfarlane, said regional Queenslanders would be “cheering” the news. Macfarlane also called on government to “overhaul the loopholes in the current legislation that enables green activists to repeatedly hold up projects in court”. “We are still a long way from the finish line thanks to the foreign-funded green activists,” warned Macfarlane, noting that the project still faced multiple court challenges.